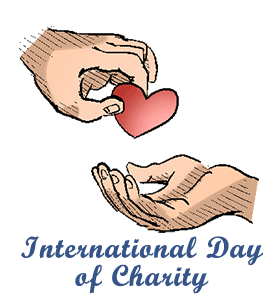 ﻿International Day Of Charity: Calendar, History, Tweets, Facts, Quotes & Activities. The International Day of Charity seeks to promote and recognize charity and its role in easing humanitarian crises and suffering in the world. The day also serves to recognize the work of charitable organizations and individuals around the globe whose philanthropic actions have contributed to the creation of more inclusive and resilient societies. The International Day of Charity was designated by the United Nations General Assembly in an effort to mobilize the world to help others. The day is celebrated every year on September 5th, the anniversary of the death of Mother Theresa of Calcutta, one of the most philanthropic individuals of our time. Mother Theresa passed away in 1997 at the age of 87 after a lifetime of charitable work with the sick and dying in India. Any charity donations that are made are tax deductible in many countries the year they are made. Meaning, that if you donate in 2015, you can claim that charity donation as a tax deductible! Americans donated approximately 2% of their disposable income to charity in 2014. This amount has remained constant over the past decade, despite large fluctuations in the economy. The annual average US household charitable donation is $2,974. 98.4% of high earning households give to charity and 63% say that a major motivation for their donations is to give back to the community. Let us always meet each other with smile, for the smile is the beginning of love. – Mother Teresa, world-renowned nun and missionary. Watch a movie about the impact and importance of charitable work. Some suggestions are: Pay it Forward (2000), It Could Happen to You (1994), and The Letters (2014). Spread awareness about the holiday by using the hashtags #InternationalDayofCharity, #Charity and #MamaT. Buy a book that directly supports charity. All net proceeds from any of the books listed go directly to charity. Ready a great story and support a good cause all at once! Donate to your favorite charity. If you do not have a charity of choice, Charity Navigator can help you find one. There’s a charity that just about everyone can find reason to support out there. Read a book about the impact and importance of charitable work and about the charitable life that Mother Teresa led. Some suggestions are: Abundance , Systems Thinking for Social Change , Start Something that Matters , The Joy in Loving and Mother Teresa: A Simple Path .